Italian Style Baked or Fried Chicken Cutlets are my mom's version of chicken fingers or mommy chicken nuggets. 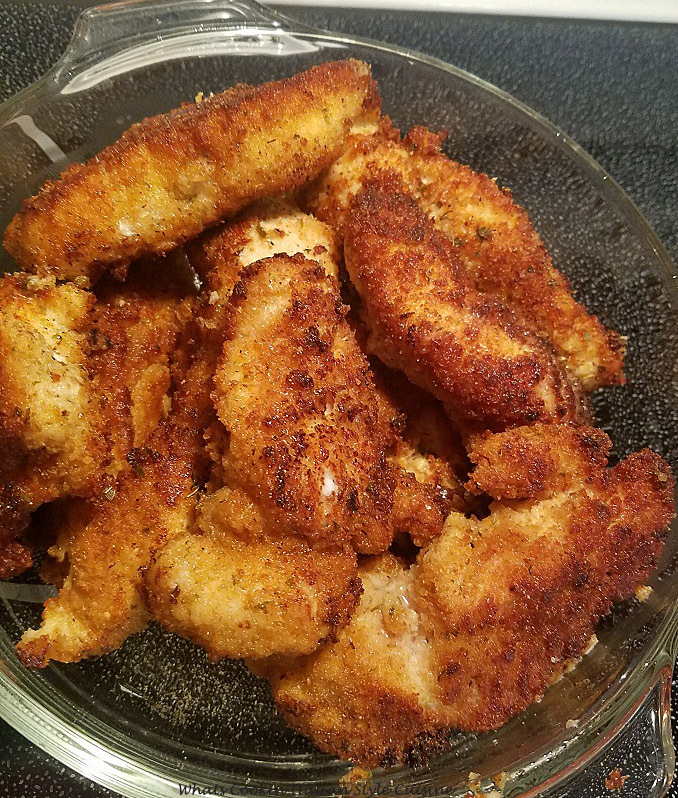 Depending on how you cut the chicken either in long slices or small pieces, the results are the same delicious baked or fried Italian flavored coated chicken cutlets. These are delicious fried or baked. Easy to make. I only use boneless chicken breast. The chicken is always tender and juicy. The first photo is the fried version and the second photo is baked. These are a great starter for any kind of toppings, chicken parmesan comes out perfect with this chicken recipe. Quick and easy chicken baked in the oven and the taste of fried chicken just healthier, of course you can still fry them if you prefer. These are great either way! Slice the breasts 1/2 inch thick pieces. Shake in flour. Dip in egg. In a ziplock bag add 2 cups bread crumbs with seasoning and cheese, shake the chicken in this mixture. Place chicken on a foil lined or parchment lined baking pan coated with and cooking oil sprayed. Drizzle lightly with olive oil. Bake on 400 degree oven until browned and crispy on top. Note: Coat the same way for frying. Heat the oil on medium. Place the boneless coated chicken in the oil and fry until golden brown on both sides around 4 to 5 minutes on each side or until the juices run clear. An excellent weekday dinner, great that the chicken cutlets are baked. They look delicious Claudia and easy to boot - a winning combination. Looks great! Love the cheesy herb coating. Easy and a good dinner! I've been baking my breaded chicken in the oven for the longest time now...except, I learned a little helpful 'hint'...instead of dipping them in eggs, I simply let them marinade in bottled Hidden Valley Ranch dressing; using 1 cup. It has all the herbs that's needed...I use a little extra garlic powder as well, and shake...shake...shake it in a baggie. Either method, they are so delicious baked that gets the fried flavor w/out frying. Hi Claudia, all your simple recipes are so irresistible and delicious. This chicken cutlet look really good. I will try this next time instead of deep fry.